Image: Adam Pawlus' kitchen, in a G.I. Joe backdrop. Commentary: One of my pet peeves is when Hasbro announces a "new" figure and it isn't. 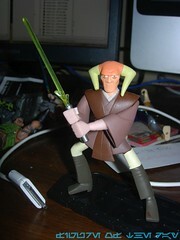 For example, at the 2011 New York Comic Con slide show, a Mace Windu figure from The Clone Wars was introduced as a "new" release despite having debuted in summer of 2010. 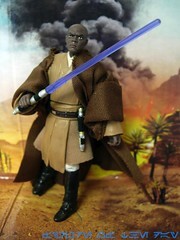 This Mace Windu from the movies could have been introduced as a repackaged figure, and none would be the wiser. The core of the figure is recycled 2007 parts-- the bulk of the body was used for a Revenge of the Sith Mace Windu during the 30th Anniversary Collection, and this one is an incremental improvement over it. The lightsaber's purple is different, and his lower costume has been improved-- oh, and he has a new head sculpt. I cannot say that I believe the Samuel L. Jacksonness has been improved, but the ability of this figure to be posed is certainly better. The big difference comes from the belt-- there is now a place to hang his lightsaber, plus some cloth bits which help him to sit. The 2007 release had a hard plastic shell which basically resisted all attempts at forcing him to take a seat, which wasn't exactly fantastic. 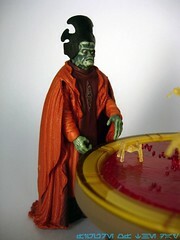 The mold for the body has been used a few times, for other Mace Windu figures as well as other Jedi. If you're only going to get one Mace Windu, I would probably steer you to the animated figure-- but from the movies, this is your best overall bet right now. I'd like to see the hip articulation improved and I'd like to see if they can make the face just a little better, but it's still fine. I mean, it's obviously Mace Windu, but I think that first 1998 figure may have been the one to get the look-and-feel the best, even if it isn't the most authentic or the best articulated. Collector's Notes: In early 2012, this figure could be found at certain US closeout stores for as little as $4-$5. At that price? You'd be foolish to pass on it. For $10, I can't say he's a worthy upgrade... but if you have no Mace Windus in your collection, $10 doesn't feel too bad. 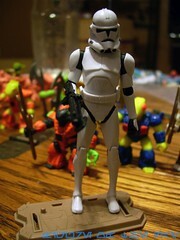 The figure is made of the 2003 super-articulated Clone Trooper, but given new paint. Back then, it was the Rolls Royce of Star Wars figures and for quite some time seemed to be the untoppable high point of the line. The only thing that could make it better would have been more joints, and Hasbro basically finally did that in 2011. (Some may disagree that the new sculpt is better.) I like this figure for what it is, and from when it is, and so far it hasn't been brought back. Because of the black blast markings I'd suggest tracking it down, but if you're anything like me you realize that you have close to 200, if not more, different Clone Troopers and anything that isn't wildly different or totally new is hard to view as anything better than merely OK.
Collector's Notes: Today this set is worth $10 or so on eBay, making it a surprisingly good deal. Of the four sets, the color/dirty configuration was the first to sell out at Entertainment Earth every time. Commentary: By your request, it's the Rebel Pilot (Mon Calamari) whose entire claim to fame is that he was cut from a movie and basically nobody knew he existed until last year. Hasbro selected a handful of figures to produce as figures, and this one was the one you voted to see here first! The funny thing is that he's the second pilot from the Rebel Pilot scene to get a figure, the first being Sila Kott. (She was dubbed with a male voice in the final cut, and the figure has a male body.) Like most figures from this wave, the Mon Cal Pilot reuses a lot of existing parts. The legs are from the B-Wing/Y-Wing pilot bodies (see: Nunbs, Keyan Farlander, Yong), at least one of the hands seems to be from Admiral Ackbar, while the other is similar but was probably retooled. The torso seems new, the head is new, and the upper arms seem new or potentially based on another figures-- but so far they seem "new" new. You can't see the rings in the shoulder joints, and they're clearly not reused Tycho arms from 2007 either. The gun is a reuse, if you have Jake Farrell you'll recognize it. As an actual pilot for a toy A-Wing Fighter, he's basically acceptable. He's not compatible with the most recent release from 2008, but he works with the 1997 and 2002 A-Wings if you fidget with them-- his helmet gets in the way of the vehicle's canopy coming down. If you're a long-term collector you should enjoy this, and it's not like your A-Wings need a pilot anyway-- all 3 modern releases have included pilots, after all. Collector's Notes: I have not seen him at retail yet. Based on last year, I would not assume him to be in subsequent waves, but I don't know how long this wave will be shipping. I got mine online. Commentary: This is an interesting one, from the perspective of a toy junkie. The Clone Trooper is, in some respects, a new figure. Basically it takes the 2011 Vintage Clone Trooper (from Attack of the Clones) and gives it a Revenge of the Sith helmet. This means he has the bend-and-swivel hands, ball-jointed hips, and all that stuff. A better helmet would have been great, but as it is it's pretty good. 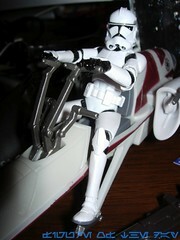 The sculpt is fantastic for riding bikes like this one, or holding his weapons. Hasbro probably also realized that tying it in with the newer-style Clones on The Clone Wars this year might make it seem fresher than the Attack of the Clones-inspired troopers we've seen so many of since 2008. So the sculpt is good-- I was a big fan of the 2011 Clone body, even if it isn't perfect for the later Clone armor, it's really good. What amazed me the most about this set was that Hasbro actually tried to make good on the higher price by giving you more stuff. I expected 1 blaster. I got 4, plus a firing rocket launcher. I can live with that. Were the clone released on a single card, he'd be $10 these days. His guns have painted deco on them, which is a nice touch, plus it adds a little more value to an otherwise samey package-- I mean, how many BARC Speeders do we all have by now? 10? More? Tossing in a newer-style figure and extra guns basically make it a desirable purchase, effectively transforming it into an accessory pack of sorts. 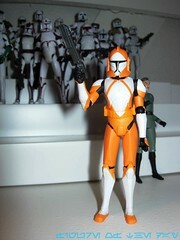 If you've lost your guns for your other Clone figures, buying this one can right that mistake. To me, that's incentive enough to pick this up-- either for myself, or as a gift. It's different enough to be interesting, although I do think Hasbro is going a little too far with the repackaged vehicles. I understand wanting to rerelease the same ship time and again, but the price increases with it starts to sting. I do appreciate the added accessories though, even if I don't need them it's nice we got something other than a creeping sense of shame that we bought the same bike again. Collector's Notes: Of the first 4 vehicles in this size class to debut this year, this was my favorite and seems to be the best-seller shortly after launch. Since the figure is distinctive, this makes sense. The others are less enticing, and frankly from the new releases it seems customers are more interested in The Clone Wars than the Phantom Menace stuff. Am I the only one who wouldn't mind seeing the line shift its focus to the TV show (and related things) completely? Commentary: While Thire and Jek made the transition to the basic figure assortment, Clone Trooper Rys remains exclusive to this set-- which debuted at Wal-Mart as an exclusive, but later appeared at Toys R Us for reasons as of yet unknown. (Presumably related to closeouts.) Rys is basically nothing special-- it uses a basic Clone body from 2008, gives it new paint and new accessories, and turns him into one of the three characters from the increasingly folksy debut episode of The Clone Wars. Compared to what would follow, that episode feels incredibly low-stakes-- Asajj Ventress just hangs around and doesn't hide in the shadows and kill, kill, kill? It seems out of character. Anyway. Rys didn't make a big splash on the series, but he did receive a brief lecture from Yoda showing us a little more of Yoda the Teacher, a character who hasn't been around much since the original trilogy. 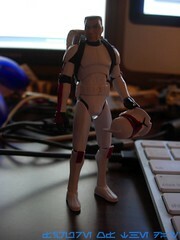 While he was basically Just Another Clone, he did bring some swell red deco and a nice backpack to the line. As he has the bend-and-swivel wrists plus ankle joints, he's arguably better than most current Clone Troopers... except the current ones have proportions closer to the animation models. So if you like slightly beefier clones, Rys is a good one to get-- these two-packs are good fun and to a good job fleshing out the bulk of the best figures from the beginning of the series. The deco is nice, but that's basically the main reason to buy him-- the mold was reused on other, cheaper figures. Collector's Notes: These sets sold slowly in 2009 and into 2010, but now people want them. Sometimes it takes a while, but it seems that on the whole The Clone Wars actually has a legit collector following which is, my guess anyway, kids getting older and spending their allowances. Now, he's gonna cost you-- so with that in mind, maybe you ought to buy something else. Image: Adam Pawlus' old kitchen. Commentary: When Kenner relaunched Star Wars in 1995, the line was a mixed bag-- some elements made them better toys, and in some respects, they weren't very good. 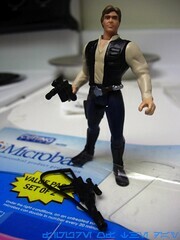 Han Solo was in the middle as one of the first figures packed at 3 per case, which was a mixed blessing. His muscular appearance resulted in numerous "Has he been working out on a Solo-flex? Hahaha!" comments which has basically changed my opinion from Star Wars humor being potentially funny to wanting to punch some people in the throat. Yeah, he's beefy, this was in the style of numerous figures of the day. His face is unquestionably Han Solo-esque, but it doesn't look much like Harrison Ford. Up until this figure, most of my action figures I more or less enjoyed without question-- they were fun, they could stand or sit or hold their guns and were basically a good time. Han Solo had problems. While I do miss the simpler construction, I don't miss the wonky pose or the gravity-unfriendly design. You see, the figure can't stand on his own-- this was a surprisingly common problem with a few of the 1995 releases, you couldn't get Han to stand upright without a display stand (and in 1995, there were none) or unless you kicked out his left foot so that his heel was on the ground and his feet were pointed in the air. Since he was released beyond the advent of separate holsters, he was designed to sit well, but the sculpt prevented him from fitting easily into the Millennium Falcon. His arms and legs weren't friendly to sharing the space with Chewbacca-- he could git by himself, but he did hog a little bit of the co-pilot's seating area. While some of the early figures were good playthings, Han Solo left a lot to be desired. As a carded figure and an artifact from his day, he's not bad. I mean, all the Han elements are here from the off-white shirt to the black vest to the blue pants with red stripes. Kenner improved on some elements from the old days, like adding a waist joint and giving him a then-impressive sixth point of articulation, but I doubt fans today would be very interested in him. His trademark blaster has difficulty being gripped in his right hand, and his secondary gun really doesn't add much to the figure. It's a nice bonus in the sense that a bonus is nice, but I can't say it brought a lot of fun to the table. I wouldn't suggest running out and getting him if you want a strong toy, but if you've got a few bucks I would suggest getting the version from the Classic 4-Pack or the real deal from 1978. Subsequent Han figures were better, and I would only suggest buying this one if you're a fan of the style of the mid-1990s. And have a spare display stand. Collector's Notes: The 1995 figures were so insanely hot when they debuted it's tough to remember just how many people stashed them away. I met people who bought a set or two to keep carded, and even some people who bought sixteen in hopes that, some day, these would be good to have around. Oddly, there are toys from this era which have jumped up to crazy prices, but they aren't Star Wars. The figure sells for $1 or so usually, but I would place its actual market value at slightly less. It's not a comment on the quality or durability of the product, but more or less the fact that there may be more of these preserved in perfect condition than the very first issue of Spawn. Since Han's face is mostly covered, the likeness isn't much of an issue-- it's Han's outfit, not necessarily Harrison Ford's likeness which should sell you on this one. Due to how he's painted I don't believe it's a particularly great likeness, but it seems Harrison is one actor Hasbro seems to have difficulty replicating properly. It's a good-looking figure and one that happily does not have the goggles glued down, so it's worth checking out. If you buy a used one, be sure to check for the goggles-- they're very small and easily lost. Collector's Notes: This set of figures is worth tracking down-- at its issue price, it was a fun set and a great deal. You can probably grab the lot of 6 2-packs (with the build-a-C-3PX) for $60 or less. If you can, you should. This set is a good one, and I'd say if it cost you $10-$15 you wouldn't be disappointed. 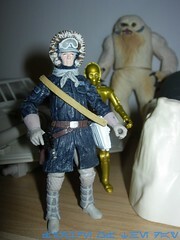 Of the figures derived from the Vintage Hoth Han body, this is one of the best. Right now, this is my preferred modern version of the original Kenner Hoth Han figure. This may change, but I doubt it-- if you want only one Hoth Han, and sitting on the Tauntaun isn't a priority, make it this one. If you want a good figure to play with, put on your desk, and enjoy, this is it. But as far as accuracy, well, no. 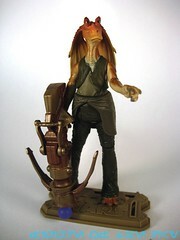 If Hasbro got Luke's boots or Qui-Gon's lightsaber wrong, I don't know that we'd let that slide-- yet with Jar Jar, I guess after a decade it's easy to accept less than Hasbro's best, even if it is really good. A repaint of this figure would be really fantastic, as the sculpt is certainly very nice. I like this figure as a toy, but there's enough Hasbro left off-- the skin tone and the goofy grin-- that I could see a good reason to do another, better figure later. Collector's Notes: This figure is new as of last week basically, and comes at only one per case in this one case so far. Hasbro alluded to a vintage Jar Jar Binks later in the year, but now I'm wondering if they meant the Carbonite one announced at Toy Fair. (In case you missed the announcement, Jar Jar Binks in Carbonite is part of a Comic-Con Exclusive in July.) Anyway. This is the best Jar Jar Binks sculpt to date, so keep that in mind when you see him in the stores-- if you want to upgrade, this is it! Wave Notes: This is a great wave-- it's a crying shame that Jar Jar Binks and his 5 all-new mold companions weren't part of the debut wave, as these are some of the best toys Hasbro has done since the Hasbro brand appeared on the packaging. The articulation isn't what it usually is, but the sculpts are great and the designs show more than a little thought was put in to how they will function as toys. Jar Jar Binks is the obvious first must-buy, but it's worth noting that Anakin Skywalker and Darth Maul are both excellent, and Queen Amidala is also quite good. 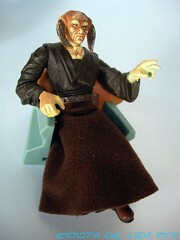 Obi-Wan Kenobi and Qui-Gon Jinn both feel like real 1980s Vintage figures, as designed in 2012. If you pop off the lower part of their robes, they can sit in vehicles. Even at $9 a pop, this batch feels worth it-- get all 6. If you liked the 2004 OTC Dagobah wave, this is-- in my opinion-- another fantastic themed batch of figures you shouldn't miss. Yes, even if you hate The Phantom Menace, these are fun figures. Commentary: I am not at a point where I cannot say with absolutely certainty if this Wedge Antilles figure is the best-- I think it may be. The fairly scarce Vintage release is shorter, but has an arguably superior head sculpt. But an inferior torso. What's a collector to do, other than buy them all? As far as best bang for the buck goes, this one doesn't disappoint, but its higher secondary market price is now kind of a drag. 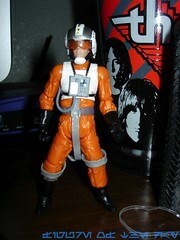 The figure is based on a variation of the Vintage X-Wing Luke Pilot sculpt, with a longer torso and, of course, Wedge's head. The head is Wedgey, although it could be more so. You basically know what to expect from this body type-- it stands well, can sit and fit in an X-wing, but has those annoying straps which get in the way of sitting. I really appreciate that Hasbro used this torso rather than reuse Luke's again, mostly because the lightsaber belt hole is an eyesore. The shoulders are a little wonky, but the figure still looks good and for the loose collector, is probably one of your better options for the price. Particularly because it also includes an X-Wing and an Astromech Droid, and because even though it's much cheaper than it was, the Vintage one is still too dang much. CLONE TROOPER Cannon Pack Fires Missiles! Image: Adam Pawlus' coffee table. Commentary: I incorrectly assumed that we had reached a point where new versions of existing characters would be as good as (or better than) previous attempts, but the sheer volume of Clone Trooper toys makes this difficult to do. This new phase of clone armor looks a lot like the 2005 clones, except it's a lot thinner and has less going for it in the way of articulation. My biggest gripe is the lack of the ball-jointed hip joints, this makes it difficult for these new troopers to sit. No ankle joints are present, and the wrists are swivel-only. It looks good, but it feels like it could play a little better. 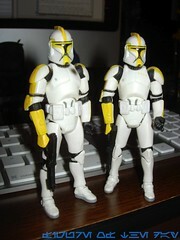 The biggest change to the armor is the panel on the back, which previously looked like the "OII" on the Stormtroopers. Now, it's the same classic Clone mishmash as seen in Revenge of the Sith, which makes sense because these are effectively those very troopers. The deco feels weak, simply because the helmet isn't as decorated as the movie equivalent. We're used to seeing a stripe on the forehead, and Hasbro opted not to include one here. This gives the figures an incomplete look, which doesn't help when the figure already looks bland compared to the TV counterpart-- after all, those troopers have squad markings. Plain white clones are far and few between on the show these days, and it's my assumption that this figure (long-term, anyway) will be more popular with customizers than with collectors. It's very OK-- I like the quantity of gear, and the jetpack is a nice bonus. I just wish the helmet had a stripe on it, it would look considerably better with a half-cent's worth of paint added to it. Collector's Notes: New! And common. Packed at 2 per case, the figure may be hanging around at a store near you right now. I wouldn't necessarily suggest running out and building an army, but then again, what do I know? I'd say it's worth getting at least one, but I personally have no interest in buying more until I see if Hasbro puts out an improved version later. Or unless I get a big vehicle needing lots of troops in it, which, right now, it doesn't look like I'm gonna get this year. I'm a little surprised Hasbro doesn't introduce new troopers exclusively in multipacks-- I mean, why let people buy only one clone? Put three identical ones in a $20 gift set, cut costs a bit, and encourage troop building. If the recent batch of Battle Packs has taught us anything, it's that people would rather buy three basically obscure clones over repacks of figures they've bought time and again since 1999. Commentary: At some point I think someone inside the Lucas camp decided to make any cool-looking character a bounty hunter, just because. Why not make him a space trucker? I have no idea, but Rum Sleg was a figure a few fans wanted and was one I found pretty exciting, as it's increasingly rare to see Hasbro release a completely new character. The red-suited creature was basically a big unknown before the figure came out, he had little history and his design was never fully explained. In the movie it was a guy in a suit-- was the skull-like mask his face, or just a mask? Hasbro's figure reveals it to be a mask, similar to that of noted slasher and movie star Jason Voorhees, best known for his appearance in the ongoing documentary series Friday the 13th. Behind the mask and under the helmet is a warty white skin, with hair-like things bundled over his neck. They extend beyond his helmet, and since (as far as I know) there is no photo reference of the costume under the helmet, this is literally it. As Hasbro does have a toyetic license of sorts to extend the character designs, filling in gaps, I don't yet know how true this is to the actual costume. Sculpt is good-- the red suit has black and silver armor. Deco is fine-- nothing special, just does what it needs to do. This is a neat figure because it looks like it could be a background character or villain from any of a number of space toy lines or TV shows, it's not overtly Star Wars in appearance and, like I said, was a rare genuinely new character in the line. I doubt Hasbro will reissue him, but I doubt he'd sell poorly if they did. It's neat, it's unlike any other figure you have (if you don't have it), so I'd give it a strong "buy." Collector's Notes: This one's not totally worthless on eBay, so you can get one for about eight bucks. I'd suggest trying to get him in a lot with his wave mates-- the L8-L9 build-a-droid is a genuine treat and one you should have. Action Feature: Firing Missile Launcher! The sculpt is basically 2008 Captain Rex, but with new arms and the aforementioned new head, which was also used of a few other figures. Hasbro got its money worth out of this tool, as the helmet (or tweaked versions of it) have been used on no fewer than 4 clones. The 14 points of articulation are great, but the arm articulation isn't a big improvement. Sure, the elbow armor has been resculpted to be more accurate to the show, but at the expense of the bend-and-swivel wrists. Now they only swivel, which makes me a sad panda. This is by no means a bad figure, but it's always a little depressing when you realize a figure lost some functionality. Collector's Notes: A delayed figure that's still more or less new due to a slow rollout late last year, the figure's price is still close to retail and you can probably still find it if you're lucky. I don't think people realize he was new, given he came on the old-style bubble and was released with other higher-profile characters on a new packaging style. 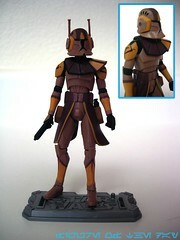 I like this figure, but I like the whole brownish red Geonosian style. If you're going after those ARF Troopers and clones, get this one too. Being a product of 1999 design aesthetics, the little guy has jointed shoulders and hips, plus a ball-jointed head. Being wiry, he may have difficulty standing if you aren't careful. He doesn't have foot holes either, so prepare for a hassle there. He has no trouble sitting, or looking cool. Since these guys are best displayed fidgeting with your Pod Racer vehicles, you can probably have them leaning or pretending to grab things. The sculpt is unremarkable, but that's OK-- the design isn't very complicated, so there don't need to be too many exposed wires or other elements here. I'm sure Hasbro could do an entirely new sculpt and blow us away, but they did a good enough job 10 years ago where I don't expect to ever see an all-new Pit Droid ever again. These are fine, they're cheap, and frankly I'd rather they keep reissuing figures (so I can skip them) than making new, different versions anyway. Collector's Notes: You should be able to score this figure off the secondary market at or under its issue price, which is great. These little guys are cool and not the kind of thing that should be a bazillion dollars. An alternate sculpt of this toy in the same colors was also sold, as were 2 other recolors of the toy using this same mold. All 6 different flavors of Pit Droid were sold as 2-packs in the same SKU. Commentary: An upgrade of Darth Maul was a long time coming, Hasbro's last attempt to "perfect" the figure was in the 2005 Evolutions packs, and fans said back then that Hasbro came up short. They were right. The new one manages to make a Darth Maul with the bulk of the important features of the day, but it still isn't quite perfect-- it's very good, but it could still be improved. For starters, he's assembled with his belt backward. The figure's articulation is as good as Hasbro will likely be able to do with today's technology. He has ball-jointed everything, except for his wrists-- they merely swivel, which is something they could probably have improved upon. I know it sounds nitpicky, but this isn't a vintage Mon Mothma, it's Darth "Cash Cow" Maul, the figure you know you can sell forever and keep repackaging long after fans claim they're sick of it-- there is always a new crop of kids and fans who want Darth Maul. He can hold his lightsaber fairly nicely, but I feel the range of movement should be improved still-- it's good, and certainly the best Maul has ever been. But "the best it's ever been" isn't necessarily good enough in the age of $10 figures. I still feel the best 3 3/4-inch scale Darth Maul, visually, is the Tatooine Showdown release. It's over 10 years old, significantly cheaper, and has a less-impressive weapon. But for my money, there's no finer Darth Maul to have on display-- his plastic robes look significantly better than the tattered robes of the new release, which, functionally speaking, are quite nice. New Maul's accessories are pretty good-- Hasbro seems to have made peace with the concept of plastic hoods and cloth robes, which gives the head a decent look while allowing for a good range of movement. I don't think the robes accurately represent the costume in the movie, though-- they were pretty funky, with huge sleeves and other swell patterns completely ignored by this one. The lightsaber finally has a flared blade, which has only happened on one other release-- the 2002 Sith Training Robes version, and that had a metal hilt. It splits in two, which is nice for any Jedi Dueling you may do. The unlit hilt can plug into his belt, and the Macrobinoculars look like they should plug into something but they really don't do much interesting. Other than, you know, holding them. Carded collectors: get this figure. 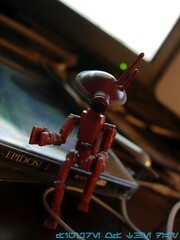 Loose collectors: you'll probably want to get this figure, as his ball-jointed hips and cloth bits are nicely poseable. But in most respects, I don't feel that it's a vastly improved piece... it's good, no questions there. The droid control gauntlet is a nice touch. But the head is merely OK, the hood doesn't look quite right, and all of these things add up to (I'm assuming) unsatisfied fans demanding a revised version of the character, which we'll probably see in a couple of years. 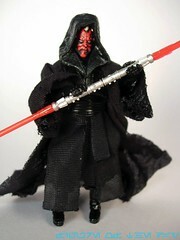 Maul is a cash cow that Hasbro hasn't milked much since the 2006 Holographic Darth Maul. Collector's Notes: This figure will be shipping with at least 2 waves, beyond that we actually just don't know yet. I assume this figure will be in steady distribution for most of 2012, because like Darth Vader or General Grievous, to not sell it would be to leave lots of money on the table. Nobody wins when you make one of the most popular characters hard to find. Hasbro has done some pretty senseless things when it comes to distributing popular characters, but this is the Darth Maul To End All Darth Mauls. Basically. Commentary: I am now quite happy Hasbro waited 10 years to really tackle The Phantom Menace again. Over the past decade we got a lot of figures again, and again, and again-- be it repacks, resculpts, or repaints that didn't do much to upgrade the original releases. But this new Aurra Sing and the whole massive launch of new figures is a breath of fresh-- or at the very least, less stale-- air. The last new movie Aurra Sing was nearly 12 years ago, and other versions of her have been inspired by the comics and TV shows. A new, super-cool movie edition has been held off for quite some time and now that we have it, I'm glad to say it's unquestionably superior to the Power of the Jedi release. 2000 Aurra had 5 points of articulation. This new one has 12 joints, plus a few of the minor quibbles of that older release have been fixed. Only one of her pistols were removable from the holsters before, and now both are. She had an awkward stance and couldn't aim her sniper rifle-- and now s he can. Her proportions are better, the sculpt is a little more bony, the coloring seems a little better, and oh yeah-- she has her antenna now! She didn't back in 2000. Her long fingers have black nails, there are all sorts of straps and buckles on her costume, and it's almost ridiculous how much better she is now. It's sort of like comparing a legit vintage Kenner figure to the Hasbro releases of the early 2000s-- the difference is remarkable. Heck, Aurra even seems nicer than a lot of other current Vintage 2012 releases-- it's surprising they didn't kick the assortment off with her! I could quibble over minor details, but why bother? The creative higher torso joint is mostly hidden by her vest. Her hair has tons of painted beads in it. She's skinny. She is colored correctly. The only thing I can whine about is Hasbro hasn't yet perfected arm articulation to do some superbly cool sniper poses. I love the lightsaber "collector case" with the bonus weapons, which are molded in a silvery plastic rather than painted silver. It seems distinctive and different from other hilts, even though the molds look pretty familiar. 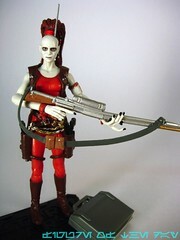 As a fine example of what Hasbro can do in 2012, it's hard to find something more perfect than Aurra Sing. Short of giving her a vehicle, or a lightsaber of her own, I couldn't imagine improving her all that much. Hasbro should be proud. That's the good news. The bad news is that the bar for the new Darth Vader is set so high that I can't imagine being anything but let down, but overall this has been a good batch of figures so far this year. 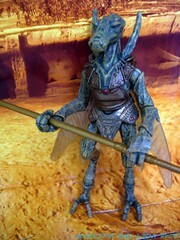 Wave notes: I found this figure-- and several more-- in a large in-store display with dozens of these exclusive figures. I have also heard reports that they ship in cases of 12, but my store had tons. The wave has 12 figures. 4 of which are new, and are said to be appearing on Vintage cardbacks later this year: Aurra Sing, Naboo Pilot, Mawhonic, and Gungan Warrior. Two of these are said to be exclusive to this wave: Ric Olie and G8-R3. Six of these are repacks or being sold as Movie Heroes right now: Darth Maul, Qui-Gon Jinn, Obi-Wan Kenobi, Destroyer Droid, Yoda, and a Tusken Raider. Why all the repacks? The main characters statistically sell better, so it's in Walmart's best interest to have more Mauls to move than more Ric Olies. Commentary: Before we talk up the Bomb Squad Trooper, let me address a couple of things. First of all, I don't know what this line is really called. I believe it's being dubbed "Discover the Force," which is what I'm going to use until someone else comes up with something. (I think the name comes from the Wal-Mart exclusive product packaging.) There is no branding other than merely "Star Wars" on the box. I'd also like to talk up the packaging of the new Battle Packs, which I think is a high mark for efficiency and style. It's gorgeous, and there's not a lot of wasted material-- there's some, but not as much as we've had in the past. Gone are the 3D cut-out backdrops, the set is basically a really, really wide carded figure with a big bubble and an insert. I think Hasbro could shrink it down another 20% in materials, but I don't think it would look very good at that point. This feels very spartan, I'm glad they made something that doesn't take up a lot of room or waste a lot of material. ...having said that, it screws up Cutup's leg-- you'll need to heat it so it resets itself into a position which is more conducive to standing. Anyway, let's get on to this neon orange figure, which is great but doesn't seem to be a part of a thematic whole. This is just Hasbro repainting 3 molds in a box. The Bomb Squad Trooper, also known as a Clone Ordnance Specialist, is incredibly bright. Preposterously neon orange paint has been applied to the now-standard clone body, while it seems the TV show is just a smidgen more reeled-in. I love the bright colors, but I wish they had used the revised mold which had slightly more range of motion in the hips-- as it is, this is not a figure designed for sitting. He can stand, sure. He can hold his guns, no problem. But not much else, so he'll be standing around on a shelf until I've got enough figures to do some sort of Blue Shadow Virus tableaux. Collector's Notes: The set is new and is the best-selling set of the 3 new Battle Packs. Why? It's the only one with 3 new figures. Hasbro has said these sets are geared more to kids, but kids probably have some sense of awareness of what's new and different-- they may have Han Solo or Jango Fett, but they definitely don't have a blindingly bright orange Clone Trooper. Image: Adam Pawlus' Geonosis backdrop, which was tossed out months ago. Commentary: Figures like the Geonosian Warrior are sort of the ideal multi-pack fodder-- it's a decent enough mold and a trooper, so you won't feel like a chump if you get stuck with two or three more of them. It's an upgrade of the 2006 Sun Fac mold, with new deco and all-new knee joints in the legs. This is good because, as a rule, more joints are better than fewer joints. This is bad because heat and gravity are not kind to figures with bizarre leg configurations, so you may need additional support (read: doll stand) to hold this little guy up. With all the articulation you could want and gritty green detailing, he looks super-cool but does not match his fellow Geonosian figures. Actually, Hasbro's been pretty bad about making them similarly colored since their debut in 2002, and the figures have a history of being difficult to stand and display. Having said that, this is one of the better-looking ones and if life allows you would be well-served selecting it as the one you troop-build. Even for a Sun Fac redeco with new legs, it's pretty awesome and would have made a great "vintage" figure were it packaged that way. Collector's Notes: The set came out during a pretty big dump of exclusives-- over a dozen hit Target over the course of days, as opposed to 2011 when the chain had something like 4 total exclusives for Q4 representing quite a slowdown. The set was marked down quickly and for some reason Target continued to get more of the 2009 arena sets in 2010 after this wave shipped, meaning these ones are, relatively speaking, in shorter supply. This means that it is entirely likely that there could be some out there in the woodworks waiting to hit a closeout store near you. Also notable, these sets were slashed in price nearly immediately after they came out-- I believe they were about $8.99 for several weeks. ANAKIN SKYWALKER Firing Lightsaber Launcher! Commentary: I was actually quite surprised Hasbro cranked out another new Anakin Skywalker sculpt after having just released a very good one in the 2010/2011 range. Why not just keep using the same sculpt? After all, he has no new articulation-- the figure continues to lack ankles, and while thinner, he doesn't really look significantly better than the last release. He's still good-- don't get me wrong, but it's an overall lateral move. It's not better, it's not worse, it's just different. The biggest change to the design is the addition to some cloth bits which allow for improved use in vehicles. He can sit better, although not significantly so. The range of motion is improved somewhat, but the deco is really what's visually different. The robes are a darker brown, with an almost grey piece hanging over them. He seems thinner and a little more rounded, his face isn't quite as angular as his predecessor. If anything, the head sculpt reminds me more of the 2008 versions of Anakin.. a little rounder, a little paler, a little less harsh. A tiny detail that I'm quite happy to see added is a communicator on his left wrist, which has been lacking from most previous releases. Bravo! His new lightsaber launcher is an interesting but wonky piece of equipment-- it's charming in that it reminds me of the Kenner of old, in that it's too big to carry (ala Jurassic Park weapons) and the "lightsaber" part really doesn't look like a lightsaber. 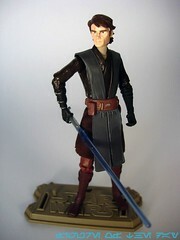 The launcher itself has a swordlike silhouette, and a teeny-tiny clip which can be positioned on Anakin's arm. At first glance, I thought it was designed to hold his lightsaber. That's how small it is. Overall I would say it's an acceptable figure. It wasn't an essential release, and it looks marginally closer to the animation model than the previous one-- and the previous one looked a little more heroic with a thicker build and a harsher face. However, this 2012 Anakin can hold a weapon with either hand, so I guess that's an important evolutionary step forward. I'd much rather have seen an entirely new character (or outfit for Anakin), but it's a perfectly acceptable figure for kids and, I assume, most collectors. Collector's Notes: New! And common. Anakin, Commander Cody, and the Clone Trooper were the only overwhelmingly new figures in this wave, with a refreshed Cad Bane and a repainted Chewbacca rounding it out in terms of potentially interesting releases. Given that this makes up 10 of the (alleged) 19 figures we're going to get this year, and we just saw another 5 pop up in a preview, I have a hard time believing that this will truly, honestly be all we see this year. Commentary: I did not pass on, but missed Saesee Tiin as part of the Wal-Mart exclusive, supposedly-had-a-street-date, DVD-companion figure sets. I was livid-- I checked several stores for days before, during, and after the release and there was no real sign that they had ever been there, which is the kind of thing that toughens you up real quick when it comes to having to search for stuff. Since the sets were basically repaints or retools, I waited and I'm more or less glad I did. Secondary market prices spiked quickly, and the figure, while good, isn't really worth the insane attention that it got for a while. Based on the animated version of Obi-Wan Kenobi, the figure has the same articulation (and body) as the other Jedi. A new head was created, new deco was applied, and presto-- new figure. Even the same ribbing sculpted on the forearms is present, giving-- at first glance-- the illusion of this being a new figure. The package art shows Saesee's amazing armored outfit, which sadly did not get an animated figure, but at least this nifty design retained the broken horn and did a bang-up job capturing his scowl. The articulation is particularly strange, given the figure's statue-like appearance. His waist and neck joints are perfectly normal, but his left arm swings from the left to the right, as opposed to rotating up and down like most figures. He can hold a saber with both hands, and the squared-off, stylized sculpt does a great job of replicating the look and feel of the animated series. I like this collection of figures as a subset, and while it's a terrible toy it makes for a nice display piece. The head is the neatest thing about the figure, with his distinctive head markings and horns giving him the bulk of his personality. I wish it was in his clone armor, but well, sometimes Hasbro's desire to release something quick and on the cheap trumps something being superbly cool. As it is, it's just OK-- a nice piece of a good set. Collector's Notes: Today, this set sells for about $15-$25. I got mine at a comic shop for $13, which was about as good as I could hope for. As a subset, the animated Clone Wars line is one I'd suggest new collectors jump on-- not only is it gorgeous, but it's small and relatively cheap. Roughly 17 figures, including Grievous and Clone variations, should set you back about $100 if not much less. There are various packaging variations and multipacks, but just getting a set of the figures to crack open is fairly cheap and, most importantly, this is a dead line. You can get 'em all and rest easy that, according to Hasbro, they will not be making any more in this style. Commentary: I bought Saesee Tiin and the other Toys R Us exclusive Jedi High Council sets in 2004, and they stayed in their boxes until now. Heck, some of them are still sealed. Why? Because they are sort of boring, only good as display pieces, and not particularly good in the figure department. It was nice seeing Hasbro bow to fan demands to complete the scene, which started in 2003, but sometimes it's nice when they wait a few years-- better sculpts, better technology, or less miserly management may yield a better product, and at the time reissued or repainted figures were around $4.99 each. This set at $19.99 each, with no weapons and few newly tooled parts other than an occasional knee joint, felt more like an obligation than a purchase of joy. But I wanted the "playset," so I bought it. Saesee Tiin makes use of the 2002 sculpt. You get no lightsaber, no weapon. The toy has jointed hips and no knees, so getting him to sit properly is quite difficult-- I took several photos trying to not make him look too awkward, and I don't think I succeeded. As of 2004 this was arguably a better figure due to its swell soft goods allowing for more movement, but with no lightsaber and a really half-assed ability to sit, it was weak. The figure itself has only 7 points of articulation and if it weren't for his accessories, I probably wouldn't have bought this set. I basically paid $20 for some chairs and a tile floor. The chair is nice, molded in a blueish hue with red fading into orange, and it seems like it would be an ideal place for another, better figure to sit. Since the 2005 Saesee Tiin is one of Hasbro's finest figures, perhaps you'll want to buy this set just to use with that figure. Collector's Notes: The set is worth about $30 on eBay, but sellers in China are selling the base and chairs for a few bucks. I would like to say "go buy it," but there's an added floor panel included with this boxed set which does not seem present in the auctions-- so if you want to complete the council chambers, do not buy the bases without the additional floor panel piece. (It's under the floor in the boxed item.) All six sets will probably set you back $10-$30 a pop, so you should be able to complete the scene for $100 or less... just remember, you'll want to replace (upgrade) the figures included with most of the sets. Commentary: I like Nute Gunray. 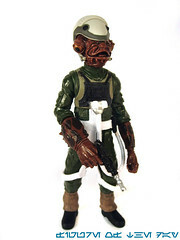 Not as much as I like Admiral Ackbar, but it's a neat character and an easy target for making jokes-- specifically, doing Taco Bell ads in his voice. Trust me, good times. Anyway, this figure-- which I believe is the most recent version of the character in action figure form despite being about 9 years old-- is actually a redressed version of the 1999 figure. (He even has a 1998 copyright date on his foot.) The head and coat is new-- the body and arms are old. I'm willing to bet most fans didn't notice, in part because the set comes with a swell half of a table and I would assume everybody's first reaction to buying this set would be to assemble the table and ooh and ahh over it. It's a nice table, with clear red surrounded by some yellow, covered in little yellow holographic vehicles. It's a nice little decoration. Nute Gunray has only 3 meaningful points of articulation, with the neck and shoulders getting a decent range of movement. His hips and waist are articulated, but due to the robes they're really quite worthless. 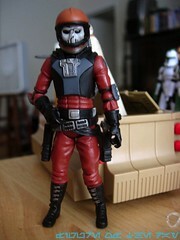 Thankfully the sculpt is good-- his head looks a lot like the mask in the movie, and the hat is a nice touch too. His face is quite colorful, with shiny eyes giving him a smidgen more soul than your average alien action figure. The robe sculpting is sharp, with lots of folds and detail-- it actually looks significantly better than the figure in the robes, because of the time difference in their creation. Hasbro could do a better version of the Trade Viceroy, but probably won't-- which is a shame, because Nute makes for a nice figure. As this is the best Nute to date, you may as well buy it--if Hasbro doesn't announce a new one at Toy Fair, I have a feeling that this character's window may have permanently shut. Collector's Notes: The Geonosian War Room and Jedi High Council sets were highly anticipated, and these first 4 "Saga Scenes" were dumped at Kay-Bee for half price. You should be able to get this set for $10 or so-- the set-- not just one figure. I give it a strong recommendation for ten bucks.